Synopsis: Librarian-spy Irene is working undercover in an alternative London when her assistant Kai goes missing. She discovers he's been kidnapped by the fae faction and the repercussions could be fatal. Not just for Kai, but for whole worlds. Review: Libraries..dragons...Venice...masks. Nuff said go by the book and read it! I remember having slight issue with the first book (I think it was the robots) but this book I fell so easily into! It flowed like a river, pulling me along and it was over far too soon for my liking! There was great pace, tension, magic, and it was written very well. Firstly I LOVE the concept of the library, it reminds me of the Thursday Next series by Jasper FForde, and sets the mind alight with possibilities. Its also interesting how books are a stabilising factor in a world, and if there is an opening for a Librarian I'd like to apply! Secondly venice is a beautiful city, in my imagination because I've never been, but with the pictures I've seen this book became very visual and it's a fantastic place to set the book, as well as being a nice juxtaposition to victorian London. It shouts elegance and character, which it should being a chaos infested Fae world! 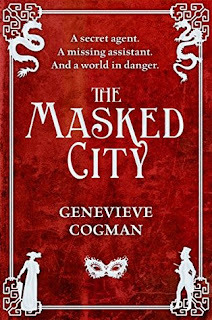 It also allowed for the introduction of masks...I lovvvve venetian masks, they have such detail and character, and speak of time past *shivers of the though*. It was also a great analogy to the secrets that every holds and the games that people play in the book. Irene, Kai and Vale are all strong likeable characters, and even Lord Silver is a likeable character (as a villain) and they bring something different ot the table that meshes together effortlessly. Kai is this almost brooding heartthrob dragon, but he is presented more as man than a teenage crush. It isn;t cheesy its effective. Irene is a very switched on woman, fiesty, little bit of whit thrown in and she's a strong independent female. Vale brings in the element of tradition and the conventions of victorian crime, which together creates a fantastic crime busting team. With a LOT of potential. Oh the places this series could go, and oh how I can't wait to explore them!